Legend Brands Restoration | Crawlspaces: Are You in Compliance? Home Tech Tips Crawlspaces: Are You in Compliance? 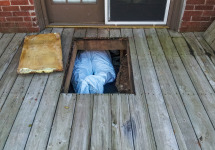 Crawlspaces: Are You in Compliance? Unless you have taken a 40-hour HAZWOPER course, you may not realize that Occupational Safety and Health Administration (OSHA) considers crawlspaces to be a "confined space" and that serious safety issues are associated with these spaces. Crawlspace configurations generally include restricted or limited access, requiring employees to squeeze in and out of small openings and perform tasks while cramped or contorted. There are also many instances when restorers who work in confined spaces face an increased risk of exposure to serious hazards such as duct work, electrical wiring, plumbing or even Category 3contaiminated water such as leaking sewage (“blackwater”). In some cases, confinement itself poses entrapment hazards. In others, confined space work may pose risks such as asphyxiation caused by lack of oxygen. This could be the result of poor ventilation or the presence of other gases such as those found in sewage backups. The health and safety of you and your team should always be your first consideration when evaluating a building and its environment. Adapted from “Crawlspaces: An Accident Waiting to Happen?” by Darren Hudema, Cleaning & Restoration (May 2006).